My neck issue is pushing me off the bike for a while. I’m tired of fighting the pain. I see a neurosurgeon in two weeks. Then it’ll be time for more decisions. In the meantime I’m staying off the bike. Even the recumbent hurts me on bad days. My eating habits are only slightly better than before. I have purchased a new hot-air popcorn popper. I used it tonight. Plain popcorn used to be a comfort food for me, but I had thrown away the old popper. Now I can go back to this filling, low-calorie, snack that I used to enjoy. In spite of the challenges, I’m in a good mood. I’m not trying too hard to lose weight, just trying to prevent myself from gaining for a while. Things are working well with Robin. We’re now going out and doing something besides eating. We saw a concert on Friday and a movie on Sunday. We met with my daughter and her boyfriend on Saturday, but we did go out to eat then. I feel more motivated to take care of housework and other related duties than I have in a while. I probably won’t see Robin next weekend, but that will give me time to thoroughly clean house and catch up on other duties that need to be done. I’ll take the bus to work most days now that I’m not riding my bike. I’m considering walking a couple of days a week though, including tomorrow. At least it’s still exercise and it doesn’t seem to hurt. It’s fitting that I’m writing a post titled “Wake Up?” at 3:00am somehow… It is interesting laying in bed on a January night with the window open listening to a thunderstorm. A few days ago temperatures were in the teens. Tonight it’s 55F. I didn’t ride the recumbent today (yesterday?). This became important later. I rode the Big Dummy. I had my doctor appointment with my new family doctor. I like my new doctor. He’s nice, competent, and is honest. 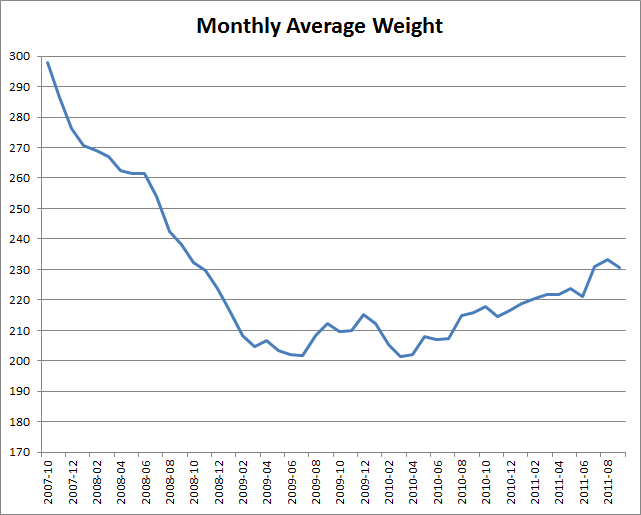 He pointed out that my overeating and drinking are not only working against my weight loss effort (what weight loss effort? ), but are adding to my depression. So anyway, I met up with Tim again after work for our hour-long spin that we often do on Mondays. As we rode more, my neck hurt worse. It probably wouldn’t have been an issue on the ‘bent. When we were nearing the end, I headed back on Payne St rather than following him back to his car on Mellwood Ave. I wanted to cut the ride short. I could have/should have went home. Instead I stopped for food and beer. I had my laptop with me so I made use of the free wi-fi and posted about my gastronomical disaster on BikeForums. 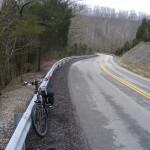 The BikeForums post, the discussion with Tim while riding, and my doctor’s advice are all ganging up on me. It is time to make a change. Sure I lost 100lbs in 2007-2008. Since then I’ve either held steady or gained. I’m up 30lbs from my lowest weight. 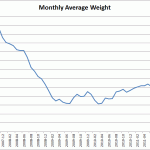 I don’t want to be The Fat Guy anymore. The neck pain has mostly ended long rides, but I can change that by riding the recumbent. I just have to push myself out there and I will ride. I miss disappearing for a day with the bike and a camera. I can still do it. I need to make some major dietary changes, but I’m not writing out new rules here right now. I’ve done that a few times recently and failed each time. I’m going to make some changes now, but the changes are more minor and less strict. I’ll figure out more later. I will start riding more immediately also. There’s also the issue of Robin. We tend to go out to eat every day. She wants to make changes too, so maybe it’s time. Overall, I think she eats better than I do. We’ll need to figure out social activities that don’t involve copious consumption of calories. Posted on January 17, 2012 Categories Bikes, Food, Mental, Relationships2 Comments on Wake Up? Relationships Are Hard – I’ll Just Ride My Bike. I’ve said that too much recently, but it’s true. My divorce is final as of Monday. I found out yesterday, and got the paperwork today. I’ve spent a lot of time thinking about what could be done differently. I’m done thinking about it now. It feels like self-flagellation, and I don’t want to do that anymore. When I talk to people about it they seem torn between saying “I’m sorry” and “Congratulations!”. It’s kind of funny. In reality it’s just closure and that’s a good thing. I have to keep reminding myself of my unhealthy relationship with food. I haven’t been great about my new rules. On Friday, some co-workers were getting together to go out for food and beer. I was invited, and social occasions are allowed per my self-imposed rules. The fact I had an overly-large lunch earlier wasn’t good, but whatever. I had a beer called “Morning Wood”, and I even shared my “Morning Wood”. I made a (probably annoying) comment about the bike rack being free when others were complaining about parking meters. I slept in Saturday. I went out for a ride with Tim. I got about 23 miles in. I ate leftover split-pea soup. I hadn’t gone grocery shopping. I really wanted to go out for food and beer. I successfully suppressed those urges. I got up early today, Sunday, to meet Tim, Patrick, and Asher for a ride today. I left before sunrise in the cold air. It was a good ride, mostly urban. Nothing epic, just four guys riding around. I did have some snacks at coffee shops, but nothing extreme. I ended the day with over 46 miles. Again, later in the day I was really wanting to go out for food and beer. I still haven’t gone grocery shopping. I’m cooking a simple peas and rice dish that I actually have the stuff to make. I’m not going back out, because if I do, I’ll find myself gorged on food and sloshing full of beer. I’m slightly depressed because I know I shouldn’t go out to eat and drink. Adding to that is the fact that I don’t like the way I feel about it. I didn’t have this much trouble controlling my eating and drinking three and four years ago. Why now? I am killing time and forgetting about food for a while by burying myself in reading. I’m currently reading Spin, which I highly recommend, at least if you’re into science fiction. Tim talks about GAS and I understand. GAS, or Gear Acquisition Syndrome can lead to spending more time and money equipping the bikes than riding them. That’s not acceptable. I have three bikes I’d like to add to my stable. 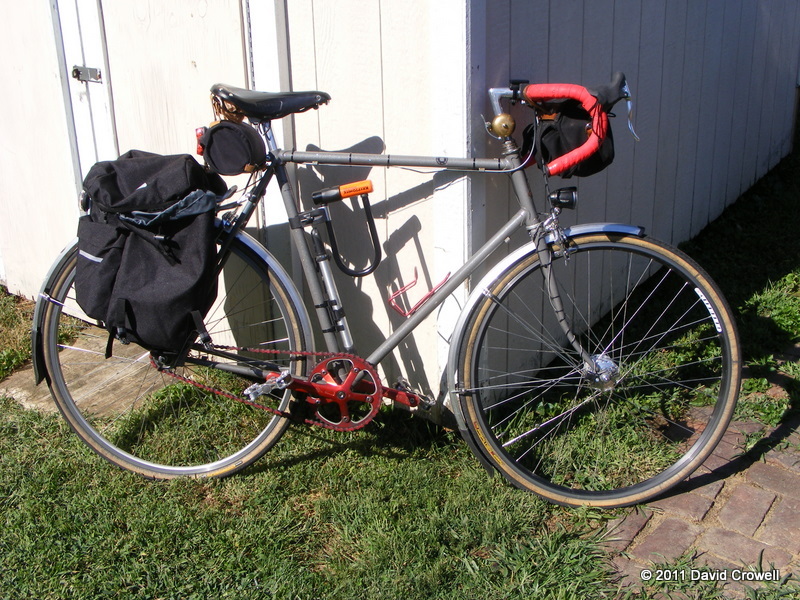 A road/brevet bike. A dedicated gravel bike, and a mountain bike. In addition to that, I have a wishlist of stuff for my existing bikes. My LHT needs some work. I want to swap out most of the drivetrain. I want different brakes. I want different front and rear racks, new wheels, lighting. Ugh. This gets expensive very quickly. I’m trying to prioritize what to do first. I already have a new front derailleur on order for the LHT, but that’s a repair. I could have new wheels built for that bike, using the existing hubs, and that would be a repair also, as the brake tracks are very worn on the rims. I don’t want to use the existing front hub though. I want a dyno-hub for powering a new lighting system. Although I already had a dyno-wheel built for that bike, I ended up using it on the single-speed. My next big purchase was going to be a frameset for the road/brevet bike, but now I’m reconsidering that. I’m thinking I need to put the money into the LHT to get it ready to be a do-almost-anything bike. Some of what I’d do is repairs. Some of it is upgrades. I spent several hours looking at bike stuff online today. I could have done something useful in that time, but I didn’t. I’m going to go do some housework now. Something useful. I have a bad habit of escaping reality through non-productive, or even destructive, means. Sometimes it’s just wasting time surfing the internet. Sometimes it’s food and/or alcohol. I’m having a rough week. I met with a lawyer on Tuesday to get the divorce started. Papers were completed today and I stopped in to sign them. I know I don’t like the way this whole ordeal has made me feel. From what little Kristy has said, she’s feeling much the same way. I wasn’t in the mood to cook after I got home today, but I wasn’t going to go out either. I decided to read another book. I burned through an entire novel, albeit an easy-reading one, in about three hours. Once done, I revisited the dinner situation. I had leftover spaghetti that I cooked yesterday. I’ve been out of beer, and I’m not going out for more. That’s probably a good thing. I have several ride options for tomorrow, but I’m not sure I want to ride tomorrow. I have a gravel ride with Patrick and Tim on Sunday. I could stand to do some housework and yardwork tomorrow. On the other hand, Timothy is putting on another LBC populaire tomorrow. Maybe I’ll get up at 6:00am, eat a good breakfast, and decide what to do from there. I’m going to go escape reality in my favorite fashion. I’m going to sleep. I’m thankful that I’m healthy enough to keep riding my bike. I’m thankful I have friends to join for Thanksgiving dinner. I’m thankful I have friends that like to ride bikes in all kinds of crazy adventures. I’m thankful for my job where I earn a decent living. I met up with Tim and Timothy this morning for a pre-Thanksgiving ride. It was a slow pace, and we cut the ride a bit short. Tim and I stopped at three different coffee shops though. That ride was 27.7 miles. I rode out to Patrick’s house for Thanksgiving dinner. I appreciate having company and it was a pleasure meeting Patrick’s family. The “bit o’ bourbon” was nice too. I took the long way home in the dark. Round-trip mileage was 28.5 miles. Total mileage for the day was 56.2. I’m sure I ate more calories than I burned, but I don’t feel like a total glutton. I had a good ride with Tim this morning. We met at Sunergos for coffee. He had planned a road ride heading out of town, but he had a mechanical issue with the bike early in the ride. We rode back to his house to get another bike. This shortened his available time, so we stuck to another day of just riding around (JRA). We really had no goal. I wasn’t feeling strong (hell, my legs still hurt) so we didn’t ride fast. I brought my camera along for the ride, but never even got it out. After he went home, I sat at Cumberland having food and beer. I ended the day at about 43 miles. Once home, I did yard work and housework. I really need to go grocery shopping again, but I hate grocery shopping and I’m constantly putting it off to the last minute. I’ll do it another day. I realized today how lazy I’ve become recently. I’m having trouble doing the things that need to be done. My house is a mess. I’m letting things fall behind. I’m not even eating properly, and I’m gaining weight again. I’m not drinking enough water. I did drink out of my water bottle during the ride, but then I was drinking beer before heading home. We’ve all made jokes about hydrating with beer, but beer is lousy for hydration. I spent a good part of the day after getting home being dehydrated and feeling sick. I drank a huge glass of water which helped. I’m now drinking a huge mug of herbal tea. Yep, I’m in a mental funk. Even when I’m not, I’m lazy and eat poorly. I’m not sure how I got this way over the last few years. I’ve made drastic lifestyle changes before. I think it’s time to do it again. I had vague plans for a good long ride today. After entirely too much beer last night, I slept in and didn’t wake up until Tim called me asking about a slower-paced around-town coffee ride. I rode the Big Dummy and met Tim at Highland Coffee. We enjoyed snacks and coffee before heading downtown then out River Rd. We turned off and unto the Butchertown Greenway. This was a peaceful stretch until on a blind curve the path was covered with walnuts. There was also a cyclist standing astride his bike talking on the phone. We made it through with no issue and continued on. After a few more city streets we were on the Beargrass Creek Trail. 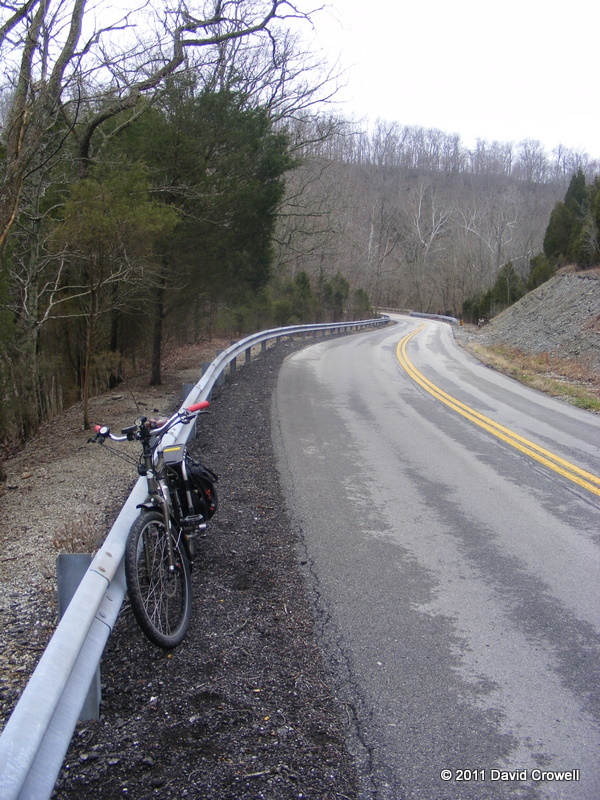 I really like this trail, and the Big Dummy makes quite the racket rolling over the bridges there. After getting through the Lexington Rd/Grinstead Dr intersection we went through Cherokee Park, then into some neighborhood streets. Eventually Tim went home, and I still needed more coffee and a proper breakfast. I went to Twig and Leaf for an omelette and coffee. The Big Dummy got quite a bit of attention from a group of cyclists who were finishing up their breakfast. I then headed for home. The Big Dummy is not a fast bike, but I was lightly loaded for today’s trip. I rode 18.9 miles in an urban area with some small hills. There were many stops. My average rolling speed was 11.8mph. I’m sure with a light load and flat straight roads and no stops, my speed wouldn’t be much less than on the LHT. I did exceed 32mph on a downhill on Eastern Parkway. I’m feeling quite lazy today. I need to do yard work, housework, and go grocery shopping. I’m not sure how much of that will get done today. I’ve had a very productive day. 12 hours worth of productive. We had a server failure on Saturday. I needed to get in early-ish today (Monday). I woke up late and grumpy, so I drove to work. Today was a whirlwind of activity. I was there for over 12 hours. I felt slightly stressed at times, but never overwhelmed (despite the problems we ran into). I guess I’m a good problem solver but bad at time-management. Time-management isn’t much of an issue during an emergency. The problems are solved. I stayed late to fix things. I got home happy but hungry. Despite “reminding myself” recently about weight loss and such, I went out for a burger and beer. It was worthwhile. Tomorrow, I’m back on the bike. It’ll be a long day with a morning doctor appointment providing extra mileage. I need to incorporate this productiveness into everyday. Not only do I do better at work, I feel better about it later. I ate (and drank) what I shouldn’t have. I’m not doing the house work that I should have. I went down to Zeppelin Cafe and had a burger and a few beers. It’s only a couple of blocks, I walked. So, I ate too much and spent too much. Tomorrow is the car-free happy-hour, and I barely have enough money for that. Things were better at work today. My mood took a nosedive once I got home. I had errands to run (in the truck) and my mood improved. One of the errands was grocery shopping, and I bought ice cream and beer, so that always brightens my day, even if for the wrong reasons. I’ve pretty much concluded that my planned century ride in Michigan this Sunday (Apple Cider Century) is not going to happen. I’m registered and everything, but with money being tight, affording gas for the drive is doubtful, and a hotel room is out of the question. I considered camping, but the weather will be cool with a chance of rain. Not ideal for camping. If I change my mind and go anyway, I’ll tough it out in a tent. If I don’t go, I have a four-day weekend, so I’ll go on several long rides over my long weekend. Eh, whatever. I’m just glad yesterday is over with. I rolled out of bed around 8:00 this morning. I cooked bacon and eggs and drank coffee. That made for a good start for the day. Around 10:30, Tim picked me up and we went to Waverly HIlls Park for some mountain bike riding. I don’t own a mountain bike, so Tim loaned me one of his, a Redline Monocog. It’s a single-speed mountain bike. I’ve ridden it before. We tooled around on the trails for about an hour. One hour of mountain biking is a lot more exercise than one hour of road riding. I had moved the dyno-powered lights from my LHT to the single-speed some time ago. 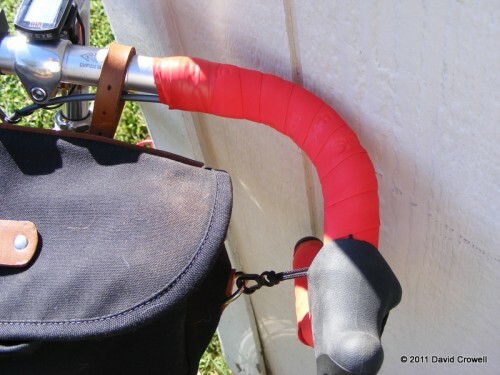 I had also bought new bar tape for the bike, but hadn’t gotten around to it yet. So, I wrapped the bars. This is my first time wrapping bars, and it shows. It’ll work, but I’ll need more practice. I used red electrical tape at the ends of the bar tape. I didn’t do a very good job, but it’ll be fine comfort-wise. It just doesn’t look good. I did yard work, lubed the chains on the bikes. I’ve got a little housework to do. I’m fighting the urge to go out for dinner (which will mean drinking beer). No matter what I do the rest of the day, I can call today a good day. I didn’t ride much over the weekend, just rode around town a little. My eating habits are worse than they should be. I’ve been in an emotional slump. I tend to use food and beer as crutches. That’s not good. I’m slowly gaining weight. I did spend a number of hours moving the dyno-wheel and lighting from the LHT to the single-speed. It was a pain. I know how to work on bikes, but I’m lousy at it. I struggle with simple things. I get it done, it just takes way too long. I’m home sick today. I haven’t left the house, and have no intention of doing so. I have groceries so I’ll eat, and I’ll actually eat healthy today. I’ve spent hours laying in bed. Some of that time I was sleeping, some of it reading. My kitchen is still a whirlwind of bike parts and tools. I need to pick up the mess before I can cook. <sigh> Maybe I’ll just go lay in bed instead.